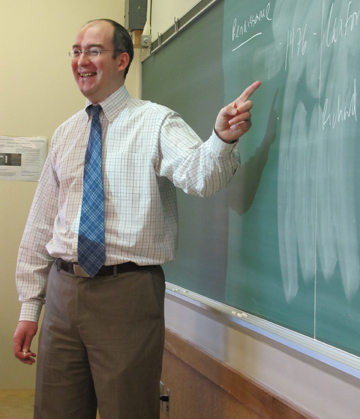 Nothing is more satisfying to Colin Fewer than when his students connect so deeply with an ancient or medieval text that the literature's long-gone world comes to life. An associate professor of English at Purdue Calumet, Fewer earned the 2009-10 Outstanding Teacher Award on his campus through his immersive classes and his passion for mentoring students. But Fewer, a native of Canada, traveled a long road before he decided to devote his career to teaching and studying to English. How did you decide on English as a career choice? I didn't even consider English as a career until I was a senior at the University of Manitoba in Canada. At that point, I was set on going to law school, and I was double majoring in English and philosophy. My majors required me to take a class on the works of 14th century writer Geoffrey Chaucer, so there I was. Almost as soon as I sat down to read Chaucer's work, I felt a connection to it. The language, of course, was difficult at first, but I enjoyed the experience of untangling it. I found that it had jokes that made me laugh -- beyond that, there were ideas that I thought were very sophisticated for the Middle Ages, which I had stereotyped as being pretty primitive. After I took that class, I still figured I'd go to law school, but I decided to get a master's degree in English first at Penn State. As I studied for that master's, though, I found that I was truly hooked. I decided to go on for a doctorate at Penn State and to focus my career on English. I haven't looked back since. What is the most enjoyable aspect of being a professor? I specialize in medieval literature and I also teach ancient literature, and both can be quite intimidating to a lot of people. The best part for me is taking literature that might be scary or intimidating to my students and showing them that it's possible to make a connection with those texts. For example, I teach Homer's "The Iliad" and "The Odyssey" as well as the work of Chaucer and other medieval writers. On my classes' best days, it feels like we're really connecting with Homer or Chaucer and with their characters. It can feel like we're talking with them and hearing them talk back, and I think that's a powerful experience. To sit in a classroom in 2013 in Indiana and to go back hundreds or thousands or years and find things funny and recognizably human -- to me, that never gets old. What sort of research are you doing now? Right now, I'm studying some 14th and 15th century poets who were great fans of Chaucer. It's been interesting to look at the things they thought were exciting and important about his work, which are different from the things we consider exciting and important about his work. For example, the medieval poets John Lydgate and Thomas Hoccleve were very interested in what Chaucer has to say about the process of becoming a subject, or a functioning member of society. At that time, for hundreds of years the feudal system had been in place, and in that system most people were peasants. They were assigned that role at birth; it was part of their identities and most people believed that it was part of God's plan for their life. It was unthinkable to try to move to the city or to even try to make your life a little bit better. Right around that time, though, that system was beginning to fall apart. Chaucer was writing a lot about the conceptual problems that occurred with that breakdown, wondering what connects people to other members of society and the king and the state. There wasn't the field of empirical political science in the modern sense at the time, so quite often the people who were thinking about these things were doing it in literature, including Chaucer. In what ways do you mentor students? I've become an unofficial mentor for students on our campus who want to go to graduate school, typically in English or in a related field. The entire process of applying to graduate school can be very stressful, so I offer students advice for taking the GRE, write them letters of recommendation, and check their personal statements and writing samples. I generally guide them through the application process. I do all this because I get a lot of satisfaction out of seeing someone with the talent and ability to do this kind of work -- which I think is really important -- go on to make it a rewarding career. Being a professor is really the best job there is, in my opinion, so helping others do that is really exciting.